For designating Natura 2000 areas, natural or environmental criteria for delimitation of smaller sub-sea areas were used and detailed provisons for those were proposed in a plan. The excercise provided a territorial grid for planning, which was a pre-condition for launching a zoning strategy. 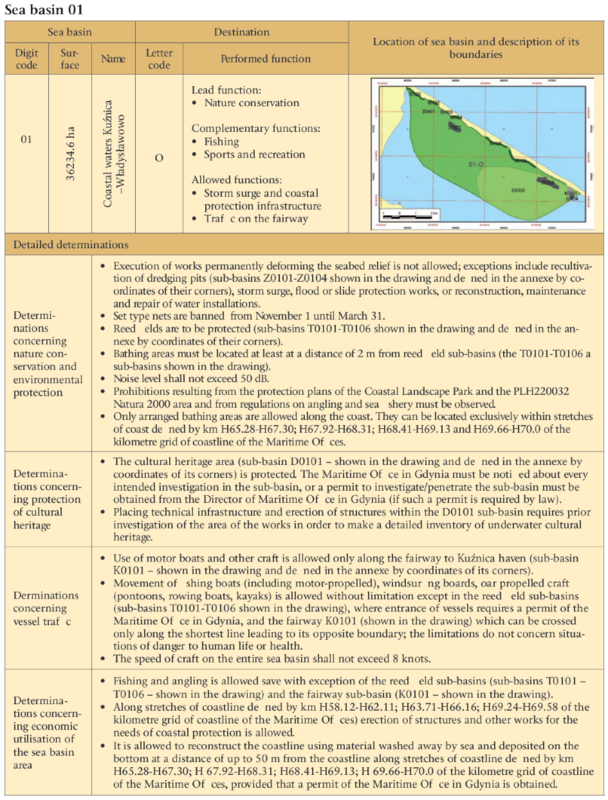 The pilot maritime spatial plan of the western part of the maritime internal waters of the Gulf of Gdańsk is described as a separate good practice (link here). One of the key problems to be tested under this plan was integration of NATURA 2000 sites into the spatial maritime plan. Those areas were/are located adjacent to the densely populated terrestrial areas and thus subject to numerous pressures. The coastal area of the Gulf of Gdańsk is home to more than 1 million inhabitants of the Gdańsk-Gdynia-Sopot metropolitan region – the biggest coastal metropolises in Poland. Two large harbours, Gdynia and Gdańsk, are located nearby. At the time the plan was elaborated, Natura 2000 sites did not yet have management plans and work on them had not yet started. It was, however, expected that such work must be done in the future. The process of elaboration of the pilot plan was extremely short, lasting from September 2007 until March 2008. The planned area had a surface of about 40550 ha. 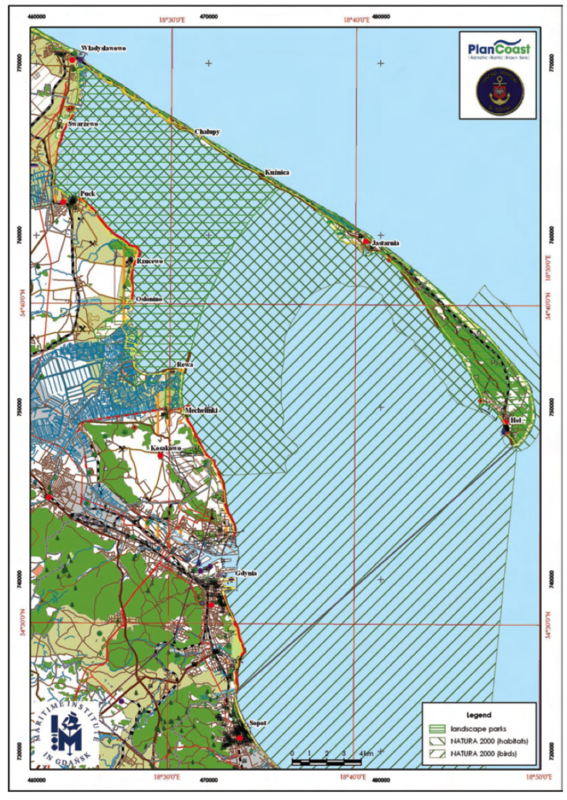 There were three forms of nature protection in the area covered by the pilot plan: the Coastal Landscape Park (10534 ha), an area for the special protection of birds – the Gulf of Puck PLB220005 – entire planned area and a special habitat protection area – the Gulf of Puck and Hel Peninsula PLH220032 – 21479 ha. Existing forms of nature protection in the planned area are shown in figure 1.
wherever possible, application of provisions concerning not only 3D space, but time. Thus the plan had a strong ecological focus given by and described as the proper functioning of ecosystems, sustainable development of coastal communities, the sparing use of the sea (temporal example of precautionary principle) and the preservation of underwater cultural heritage, which is an important element of marine landscapes. The requirement of paying attention to time also had an important ecological background, since it allowed for careful arbitration between the needs of different sea species and sea exploitation by people. For instance, the PLB site appeared to be an important resting area for some birds only for certain periods of the year. The inclusion of ecologically valuable areas into the plan was done in three steps. First, an inventory of ecological value was carried out. Secondly, the types of human activity that might pose a threat to that value were assessed. Thirdly, this knowledge was translated into concrete provisions and solutions within the plan. legal environment of nature protection in the area covered by the plan. 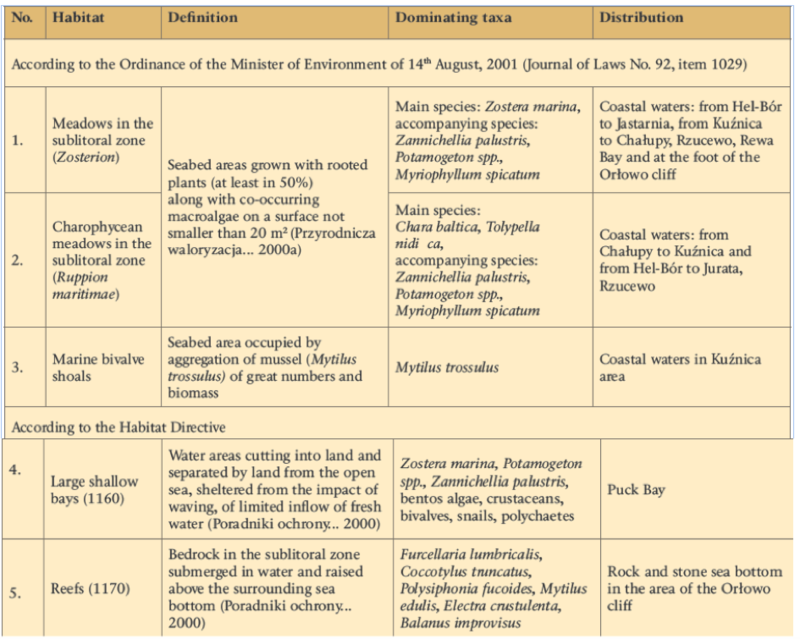 A table with collected information on protected habitats is provided below to illustrate in brief how the results of inventory were compiled (table 1). A majority of threats to species and habitats in the area of the western part of the Gulf of Gdańsk was classified as resulting from anthropogenic pressure. The threats have their source in the immediate vicinity of the Gulf and resulted from intense business activities carried out in the area of the Gdańsk-Gdynia-Sopot agglomeration. The closely situated mouth of the Vistula River bringing a heavy load of pollution and biogenes from the entire area of its catchment was also an important factor. military activities within the shallows. 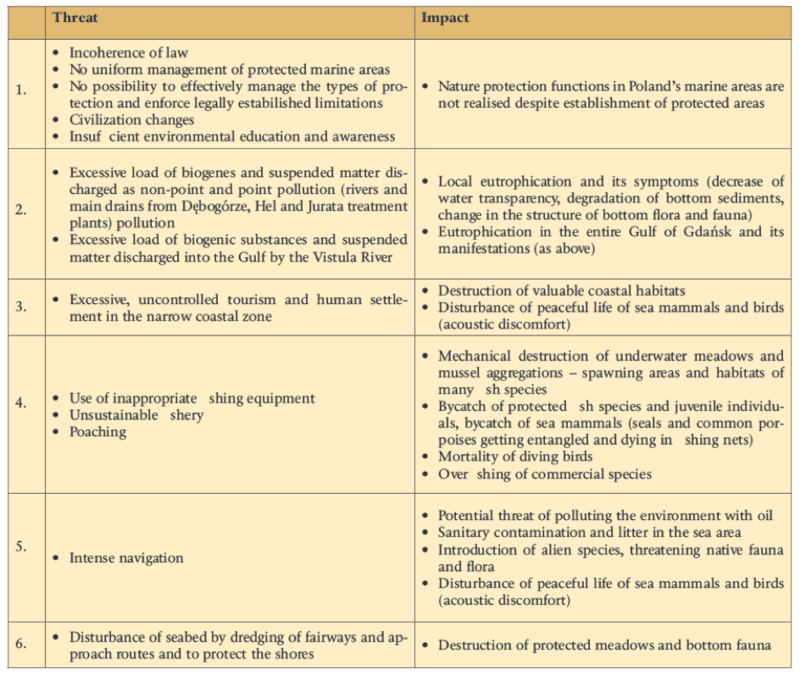 The identified threats and their negative impact on the ecosystem of the planned area are presented in table 2.
prohibition of or limitations on the use of the areas, nature conservation requirements being taken into account. Therefore out of 30 smaller water areas as many as 11 were designated as nature protection being a leading function. These covered 17370 ha, or 43% of the planned areas. Transport was limited to 1847 ha and construction of installations to 1354 ha. For each water area, detailed requirements concerning the ways of its utilization have been set up, noted in a water area chart. An example of such a chart is given in the output section. In addition, some general provisions applicable to the whole area covered by the plan were also formulated. While formulating detailed and general provisions, attention was paid to the identified threats and their negative impact on the ecosystem of the planned area. The provisions of the plan linked to and paying attention to identified threats and their negative impact on the ecosystem of the planned area can be treated as key outputs/results of the pilot plan related to Natura 2000 sites. General provisions i.e. those covering entire planned areas, are presented in table 3. 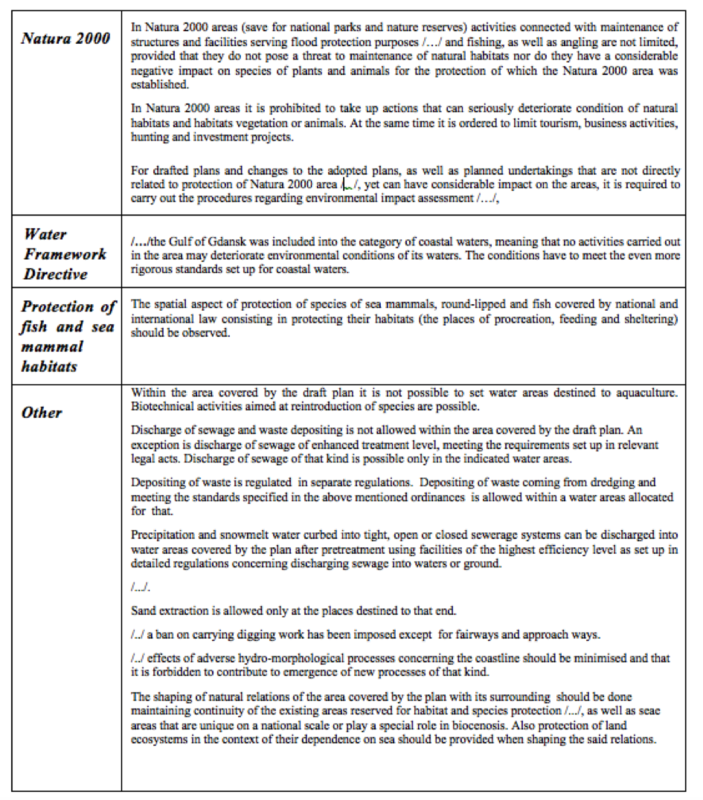 Detailed provisions for the sea water area (sea basin no 1) for which nature protection is a leading function are presented in Figure 2. Each water chart contains the information that provisions of the relevant Natura 2000 management plans must be observed when these plans are legally binding. It was therefore possible to cope with the situation that the Natura 2000 management plans were not ready at the time the pilot maritime spatial plan was elaborated. This practice is applicable in any sea area of similar conditions: high ecological value, intensive socio-economic pressures, and occurrence of different types of spatial conflicts. Contact Details Jacek Zaucha : jacek.zaucha@im.gda.pl.